As far as daises go, the group assembled to roast “Knight Rider” and “Baywatch” star David Hasselhoff was not the most star-studded, but all concerned brought the funny when it counted. With “Family Guy” creator Seth MacFarlane serving as the master of ceremonies, the roasters hit Hasselhoff in the usual places – he’s a drunk, his shows were terrible, he’s a lousy singer – but the gifted comics still found a way to mine comedy gold from it anyway, particularly Lisa Lampanellli, who owned the show’s best line. (“Your liver was so black and bloated, it could have starred in ‘Precious. '”) MacFarlane is surprisingly dry as the MC – though he did drop in a little Stewie voice when discussing Pamela Anderson’s breasts – and that proves to be the right call. The biggest surprises are unquestionably the non-comedians. George Hamilton does it old-school but still manages to throw in a few good zingers, and Anderson has much better comic timing than you’d think. As for Hulk Hogan, well, he made for a better target than he did a roaster. Hamilton, in particular, pounded him. Best of all, Hasselhoff shows the world that he really can sing, charging into the room singing “Hooked on a Feeling” and finishing with some power ballad that, strangely, has his voice drowned in the mix. When it does rise above the instruments, though, it sounds good. 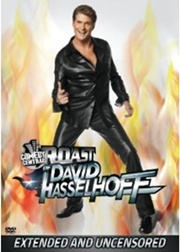 His recent reality show may have been canceled, but Comedy Central’s roast of Hasselhoff strikes the right balance of good-natured skewering. It also serves as one of the last performances by the late Greg Giraldo, who was just about to move up to the next level. Pity.